We have been blogging about this already earlier: In two weeks' time, CeBIT will be open again, and this will mark for us the start of a the 2012 product release fireworks. The first big release that is about to come in March is the version 3.0 of VARCHART JGantt. We put the entire development for this new version under the paradigm "ease-of-use to accelerate Java Gantt application development". Hence, we will just focus this new capability of VARCHART JGantt here, which comes in the form of a completely renewed Property Editor. Virtually all our customers appreciate the rich set of functionality which is provided by the JavaBean VARCHART JGantt. This functionality is based on our more than 20 years experience with developing Gantt chart software, and many of the advanced JGantt functions have become indispensable for most of our users. Of course, as an inevitable consequence the API of JGantt has also grown significantly. The resulting effect for developers is twofold: the plethora of functions on the one hand comes with a component that might look initially complex on the other hand. We are aware of this conflict between the power of functionality and the speed of application development. Consequently, we put the solution to this conflict in the very focus of the current release. Hence, the new version of VARCHART JGantt will particularly accelerate the development of Gantt-centered planning applications and will provide you with a new Property Editor. The creation of interactive Gantt charts will then be carried out even faster and more intuitive. All properties that are available for the development of the Gantt charts are newly arranged by Gantt-specific topics so that you have all available settings on one screen e.g. when you customize the timeline or the diagram part of the Gantt graph. In addition to this, all properties can be edited directly from the (sample) graphic. If you click on an object, a layer for instance, the according editor with all setting options automatically opens up. For simple settings the values of the properties are displayed by an inplace editor and the developer just has to select the desired value. For more complex settings, the user will be guided through the available properties by easy-to-understand dialog editors. Not only has the selection of the setting options become easier but also the testing of the chart's look and function can now be carried out a lot faster. Modifications of the settings are immediately performed and displayed in the Gantt chart at the lower part of the screen. That way, the user can rapidly find the optimum form for the visualization. The developer can benefit from the editor when developing a new application. It doesn’t matter whether he starts from scratch or on the basis of a sample project delivered from us. In both cases after having made the settings he can let the editor generate the complete initialization source code. Then he can either copy that code to his own application or extend the used sample to a new application. The property editor supports also the modification and extension of existing applications. At any time the editor can be started in a running application. It can regenerate the initialization code or replace the initialization section, respectively. 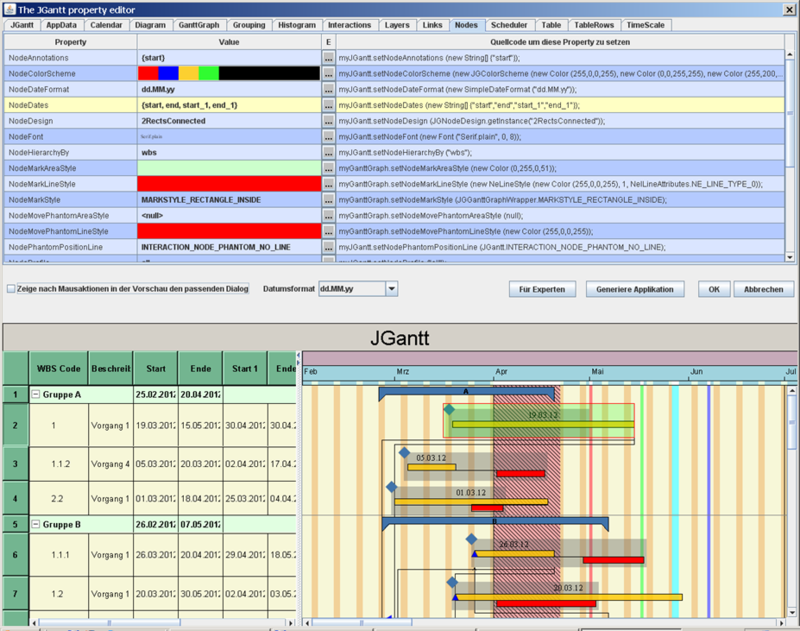 Existing Gantt applications – i.e. applications developed without using the editor - will benefit from the editor as well. In this case it makes no sense to generate the whole initialization code section, because all property settings might be spread all over the application and therefore they cannot be replaced automatically. But nevertheless the user can evaluate new property settings and if they fit his requirements, he can copy the shown source code snippets property by property. Sounds compelling to you? Please contact us to receive a complementary pre release trial version or to meet us at CeBIT.